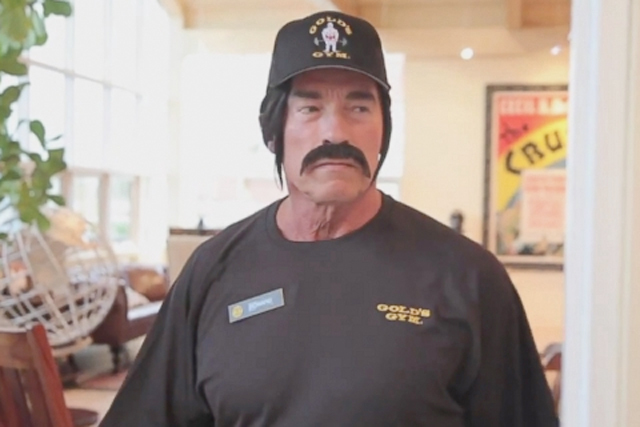 Arnold Schwarzenegger, actor and former Governor of California, dons a dubious disguise in this week's most-shared ad to dispense health and fitness advice to members of a gym. The ad for Omaze, an organisation that allows people to bid to win experiences in support of causes and charities, features Schwarzenegger interacting with a number of gym goers while wearing a false moustache and wig. In the ad, shared 264,733 times this week, Schwarzenegger poses as personal trainer and regional manager of a Gold's Gym in Venice, California to raise money for after-school activities. Following the viral success of "the epic split" starring Jean-Claude van Damme, Volvo and its agency Forsman & Bodenfors enter the chart with a new ad. Shared 175,729 times this week, the two-minute video features shots of the footballer Zlatan Ibrahimovic diving into a frozen lake and providing an inspirational voice over in Swedish, ending with the line: "I want to live and die in Sweden". As the UK, and the rest of the world, gears up for this week's Super Bowl, game day ads and teasers for ESPN, Volkswagen, Budweiser, Dannon and Jaguar, have also entered the chart. The most-shared Super Bowl ad, ESPN's "long week" by Wieden & Kennedy, was shared more than 90,000 times this week. The chart, collated by Unruly, ranks ads on YouTube by the number of shares across Facebook, Twitter and the blogosphere. Ads older than 30 days are not included.